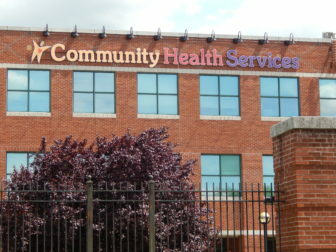 Community Health Services, a community health center in Hartford. Washington – With scant support from Democrats, the U.S. House of Representatives on Friday approved a bill that would authorize new spending for a health care program that covers about 17,000 children in Connecticut, and for the state’s community health centers, which serve many uninsured and Medicaid patients. But the bill, crafted by House Republicans, would fund the Children’s Health Insurance Program, known as CHIP — or HUSKY B in Connecticut — and community health centers by stripping money from an Affordable Care Act public health fund. That Public Health and Prevention Fund is used by the federal Centers for Disease Control and Prevention and state health departments for immunizations and screenings and to tackle a number of public health issues, ranging from diabetes to suicide. The bill also would require the wealthy to pay more in Medicare taxes to raise additional money for CHIP. And it would shorten the “grace period” in the Affordable Care Act during which consumers can pay late health insurance premiums from 90 to 30 days. Democrats say shortening that grace period will result in hundreds of thousands of Americans losing health care coverage. Those provisions prompted most Democrats, including the entire Connecticut congressional delegation, to vote against the bill, which was approved 243-174. Rep. Rosa DeLauro, D-3rd District, on the House floor Thursday pleaded with colleagues not to “play off” funding for public health and the CHIP program. Rep. John Larson, D-1st District, said he was disappointed that GOP leaders waited more than a month after funding for CHIP and the health centers expired to take action, and then put “poison pills” in the legislation. Health centers surveyed in September said they were acting because of uncertainty over federal grants. The Democratic backlash against the funding mechanism means the bill has little chance of approval in the Senate, and authority to fund the community health centers and CHIP, which ran out on Sept. 30, remains in limbo. Funded largely by federal dollars – Connecticut’s share of the cost is only 12 percent – HUSKY B covers children whose families earn too much money to qualify for Medicaid, providing health care for children in families of four earning up to $79,458 a year. A more immediate concern for health care advocates is federal funding for community health centers. A noncontroversial section of the Affordable Care Act created a special trust fund for community health centers, which serve more than 25 million people a year regardless of their ability to pay for their medical services. The money accounts for 70 percent of federal grant funding for community health centers, and that money — reauthorized in 2015 — expired at the end of September. The 17 centers in the state receive about $54 million in federal funding each year and 70 percent of that, or about $37 million, is at risk. 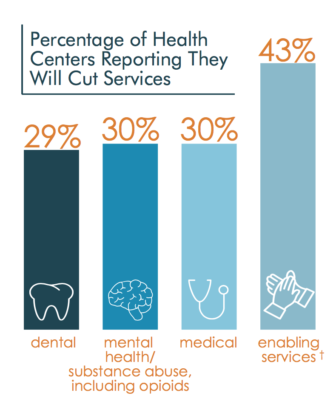 Deb Polun, a spokeswoman with the Community Health Centers of Connecticut, said the health centers have enough money to operate until the end of the year, but uncertainty over federal funding already has taken a toll. The state’s community health centers treat more than 330,000 people a year, more than half of them Medicaid patients About 45 percent of the centers’ patients are Hispanic and 23 percent are black.